Long before the term “adventure touring” came into the motorcycling vocabulary, Phil Funnell was out there doing it–around the world in the most challenging ways he could find. Phil was a restless spirit when he arrived in Canada in 1966 and the BMW R50 he’d bought new already had 300,000 miles on it. Those were miles, not kilometres, and at the age of 30 he’d already covered much of the world. A native of Croydon, England, Phil began motorcycling innocently enough on a 150 cc Triumph Terrier–perhaps a bit of a dog for an eager 16 year old. Within a couple of years he’d already explored much of the south of England on a BSA 650 when the British Army called him up for national service. While in the army he was involved in a serious collision, nearly losing his right leg. The compensation he received went toward the purchase of a 1955 Vincent with sidecar, and Phil credits the Vincent Owners Club as a major influence on his life and riding preferences. He tuned the Vincent for more speed and rode it with verve, but a collision with a car owned by a man named Frank Cotton led to a change of course. 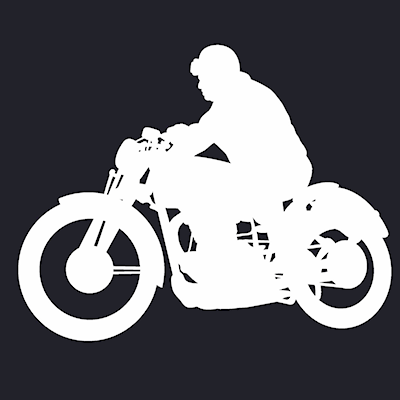 Mr. Cotton was a former racer who had founded the Cotton motorcycle company way back in 1913. Although Cotton paid for the repairs to Phil’s bike, the Vincent company had recently gone out of production and Phil began to look for another motorcycle to expand his horizons. He settled on BMW and remained loyal to the marque ever after. He began touring Europe, with two trips to Istanbul and journeys to Scandinavia and the Balkans before heading abroad to Central America and Australia. Needing more range and luggage capacity, Phil built his own large-capacity fuel tank and panniers for the bike. He lived frugally, camping most of the time on tour and working part of each year as a mechanic and heavy equipment operator to support his travel lifestyle. His earnings and tax refunds went toward the next adventure. In 1966 there was a construction strike while Phil was in Vancouver, and so he found work in a motorcycle shop on Hastings St. Unsatisfied with the service being offered to touring riders passing through, Phil resigned and opened his own repair shop across the street in a building only 12 feet wide. Operating on a shoestring, he landed a Kawasaki franchise and acted as an unauthorized BMW repair shop. He added BSA and Yamaha and before long became an official dealer for BMW. By 1970 he sold only BMW and continued for the next 14 years, becoming the largest-volume dealer in Canada. All the while Phil’s fascination with maps and curiosity about what was around the next corner led him to launch a series of so-called “Funnell’s Follies” that took him and small groups of enthusiasts to rugged adventures in remote parts of B.C. Phil’s motto was, “I don’t sell bikes, I create enthusiasts.” Actually, he did both, in the days before BMW even considered building the type of dual-sport machine they are famous for today. He also took time to write a manual for safe riding called “Scientific Motorcycling,” now out of print but selling in online auctions for $100 or more. Along the way he has competed in trials, scrambles, enduros and road racing. Motorcycle touring has taken him to every Canadian province, all 48 contiguous states of the U.S., and more than 60 countries throughout the world. Among Phil’s greatest achievements were his astounding feats of endurance riding across Canada in January and February to help publicize the Cycle Canada motorcycle shows in the early 1980s. To top this he rode the Dempster Highway in mid-winter to Tuktoyaktuk on the Arctic Ocean in the most bitter cold, requiring him to build a fire underneath the engine before it got warm enough to start. He also rode to Tierra del Fuego at the southern tip of Argentina. Fate didn’t always treat him kindly. In the mid-’80s Phil sold his BMW dealership and set off for a long dreamed-of sailing voyage across the Pacific, but the new owners failed to manage the business well and Phil was left without the money still owing. Trevor Deeley offered him work testing and promoting the new Evolution series Harley-Davidsons, and Phil made a cross-country ride mid-winter to prove the durability of the new belt drive system. Later, working in the Deeley warehouse he suffered a near-fatal fall from pallet racking. Phil survived and recovered, and with his second wife Carol, raised two children–first on a 33 foot sailboat on the Fraser River, then a 64 foot paddlewheeler. Nowadays Phil keeps in touch with motorcycling from his rural property near Agassiz.